He completed his studies and graduated with the highest Rector distinction at the Karol Szymanowski Music Academy in Katowice. He was studying also with Frans Helmerson in Hochschule fur Musik in Cologne. Recently completed his Artistic Diploma in Chapelle Musicale Reine Elizabeth in Brussels with Gary Hoffman. He has been a laureate of numerous international cello competitions, in London, Paris, Hradec, Warsaw, as well as in Katowice, but has also reached the semi-final stage at Peter Tchaikovsky Competition in Moscow, International Music Competition in Geneva, and at Rostropovich Competition in Paris. He is a very active performing artist, both as a soloist and a chamber musician. He performed in most renowned venues in Europe - Wigmore Hall in London, Victoria Hall in Geneva Tchaikovsky Hall in Moscow or Salle Gaveau in Paris. He was invited for music festivals - Verbier Festival, Sommets Musicaux Festival in Gstaad, International Music Academy-Switzerland in Rolle which is founded by Seiji Ozawa, Casals Festival in Prades, PODIUM Festival in Esslingen, Ensemble Festival in Ksiaz. He performed on stage with many great artists such as Maria Joao Pires, Augustin Dumay, Gary Hoffman, Mischa Maisky, Christian Arming, Michael Tabachnik and collaborated with orchestras like Brussels Philharmonic, Orchestre Philharmonic Royal de Liege, National Radio Symphony Orchestra Katowice, Orchestre de chambre de Walonie, Sinfonia Iuventus. He has been presented with numerous scholarships, endowed by the Minister of Culture, the President of City of Katowice, Yamaha Foundation. He has also been a laureate of the scholarship program Young Poland endowed by the National Centre of Culture. 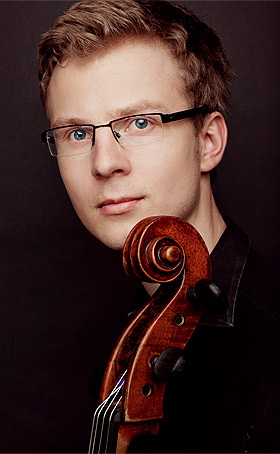 Since 2012 he is a principal cellist in National Radio Symphony Orchestra in Katowice (Poland). Adam Krzeszowiec plays an 18th Century Italian cello by Rafaelo Galliano, which belongs to the national collection of instruments at Polish Violin Makers Association.